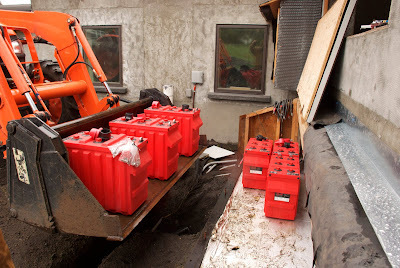 The new batteries, alongside the old in the battery enclosure alongside the garage. 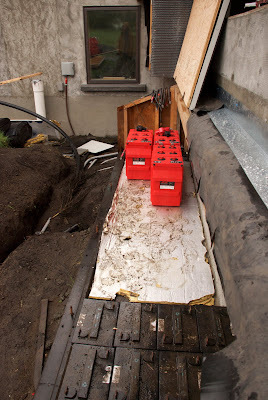 The front wall is removable so that we can do just this: get the batteries in and out. We will need to recycle the old ones. The batteries are so large and heavy, Drew needed to bring them over to the battery enclosure with the tractor. And he needed a second person to help move them into place. The Outback Mate showing our battery voltage at 25.6V first thing this morning. What a change from 24.4 first thing. It also shows that despite the cloud cover, we are making 100 watts with the solar panels. Just after our return from our trip, we finally got the call that our new batteries had arrived in Eureka. We ordered them several months ago. 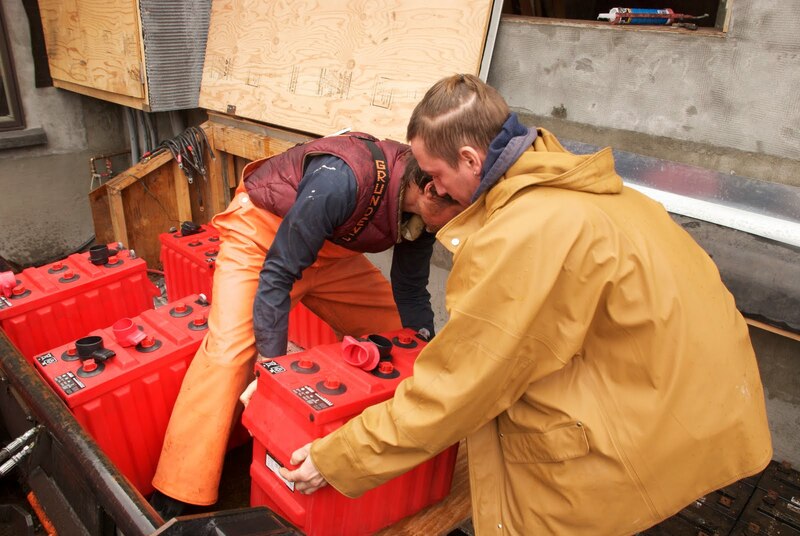 Our old batteries were very much on their last legs, requiring extensive generator use. The original batteries were really a deal. We bought them used from a neighbor who had them connected to a grid-intertie system. This means they had been held at a constant voltage for the time he had them, so despite their being used, they were in very good shape. However, they weren't designed for off-grid use, and we figured we'd get about 3 years of use out of them before they were no good anymore. We managed to squeeze 5 years out of them. These last two years, they have been far less than optimal, but they have held us up, and allowed us to build our house and keep lights on and the refrigerator running into the night. Now that we are in the house and have a good idea of what we really needed, we've got these amazing batteries. There are 8 of them, and they are large capacity, and have a 10 year warranty. We are so excited that after charging, they hold charge for hours above a low voltage mark! Wow! We are still conditioning them, and hopefully we do a good job, setting them up to perform for their marketed 10 years or so. 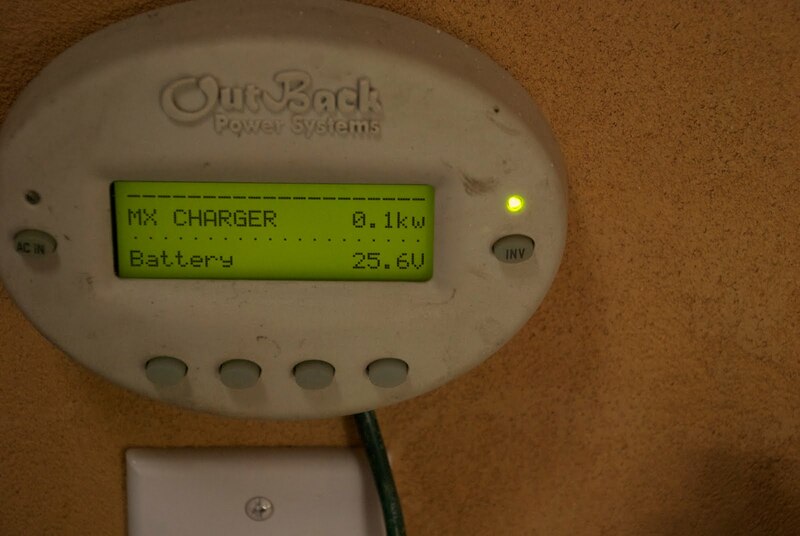 Ideally, we will invest in some more solar panels or a wind generator to maximize efficiency in charging these batteries.